Under USSC sentencing guidelines, sentenced offenders in federal courts typically receive one of five sentences: a fine; a prison-only sentence; a prison sentence plus confinement conditions; a probation sentence plus confinement conditions; or a probation-only sentence. A prison sentence (a prison-only sentence or a prison plus confinement condition sentence) is the most common punishment imposed on offenders sentenced in federal courts. Nearly nine-in-ten (87%) federal offenders in 2007 were ordered to be incarcerated in prison. Fully 96% of immigration offenders received a prison sentence in 2007, compared with 95% of drug offenders, 94% of firearms offenders and 94% of violent offenders. Property offenders were least likely to be sentenced to prison (44%) in 2007. While large majorities of federal offenders received a prison sentence, some groups of offenders were more likely than others to receive one. In 2007, 96% of Latino offenders, and 98% of non-U.S. citizen Latino offenders, were sentenced to prison. 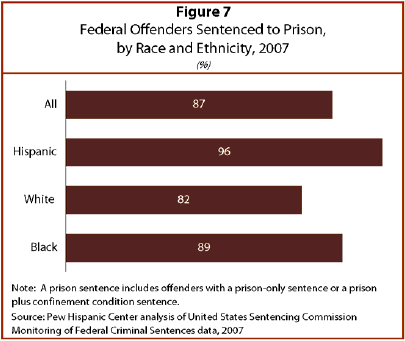 In contrast, 89% of black offenders and 82% of white offenders received a prison sentence. Because the USSC guidelines provide clear sentencing recommendations for all offenses, disparities in the prevalence of prison sentences among racial and ethnic groups are linked to differences in the types of crimes they committed. For example, Hispanics are much more likely than whites or blacks to be sentenced for an immigration or drug offense—two of the crimes most likely to be punished with a prison sentence. In 2007, 85% of Hispanics were sentenced for either a drug or immigration offense. This was 40 percentage points greater than any other racial or ethnic group: 46% of black offenders and 37% of white offenders were sentenced for drug or immigration offenses. Convicted offenders in federal courts typically receive one of the following five sentences. For more detail, see Appendix B. Fine: Offenders only fined, not imprisoned or given confinement conditions. Prison Only: Offenders only imprisoned, not fined or given confinement conditions. Prison Plus Confinement Conditions: Offenders receive a prison sentence plus a form of alternative confinement such as community confinement, home detention or intermittent confinement. Probation Plus Confinement Conditions: Offenders receive probation plus a form of alternative confinement such as community confinement, home detention or intermittent confinement. Probation Only: Offenders put on probation, not fined, imprisoned or given confinement conditions. Among those who were sentenced to prison3 in 2007, the average sentence was 60 months. Black offenders on average received the longest sentences (91 months), followed by whites (62 months) and Hispanics (46 months). Among Latino offenders sentenced to prison, those who did not hold U.S. citizenship received prison sentences of 40 months in 2007. 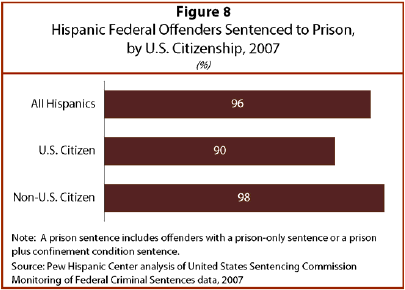 In contrast, Latino offenders with U.S. citizenship received longer prison sentences of 61 months. Between 1991 and 2007, the length of the average prison sentence among federal offenders remained unchanged at 60 months. However, this stability masks differences among racial and ethnic groups. Between 1991 and 2007, the average prison sentence for blacks increased 24%, from 74 months to 91 months. 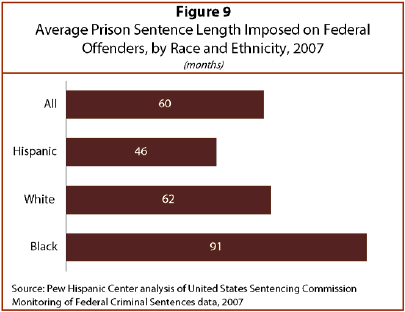 For whites, the average prison sentence length increased 17%, from 53 months to 62 months. The experience of Hispanic offenders was markedly different. 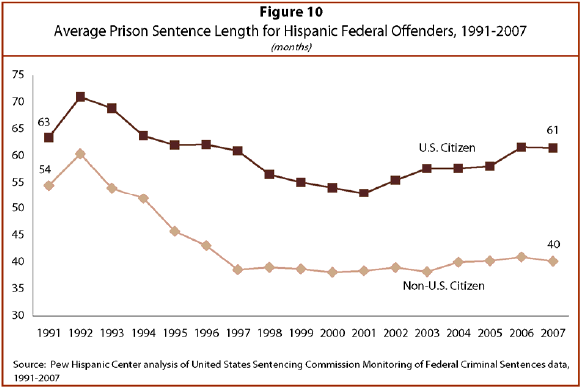 Between 1991 and 2007, the average prison sentence length for all Hispanics fell from 58 months to 46 months. Most of this decline in sentence length was due to the fall in sentence length for non-U.S. citizen Hispanics. For them, prison sentences declined by 26%, from 54 months in 1991 to 40 months in 2007. Non-U.S. citizen Hispanics received the least severe sentences among all offenders sentenced to prison since 1995. In contrast, the average prison sentence for U.S. citizen Hispanic offenders fell slightly, from 63 months in 1991 to 61 months in 2007. Just as with the type of sentence an offender receives, the length of a prison sentence is closely related to the crime. In 2007, drug crime offenders received the longest prison sentences, averaging 84 months. This was followed by offenders sentenced for firearms crimes (81 months) and violent crimes (77 months). Immigration offenders had the shortest prison sentences, which averaged 25 months. The decrease in average prison sentence lengths for Hispanic offenders is likely due to the shift in types of crimes for which they were sentenced. In 1991, more Hispanics were sentenced for drug crimes (60%) than immigration crimes (20%). However, by 2007, among Hispanic offenders, immigration convictions made up nearly half (48%) of all cases.